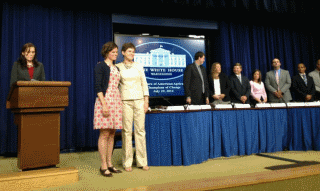 2014 Future of American Agriculture Champions of Change, at a White House ceremony. 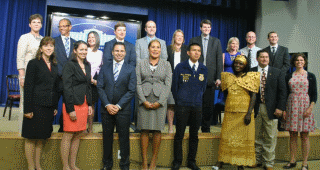 This post, by NYFC’s Lindsey Lusher Shute, was originally published on whitehouse.gov, where Lindsey has been named a Future of American Agriculture Champion of Change. With record farmland prices, climate instability, and an agricultural economy often working against them, today’s young farmers and ranchers are all Champions of Change. They are taking tremendous personal and financial risks to feed the country and build a healthy food system. I am proud to count myself among the nation’s new farmers and to represent my peers through the National Young Farmers Coalition (NYFC). 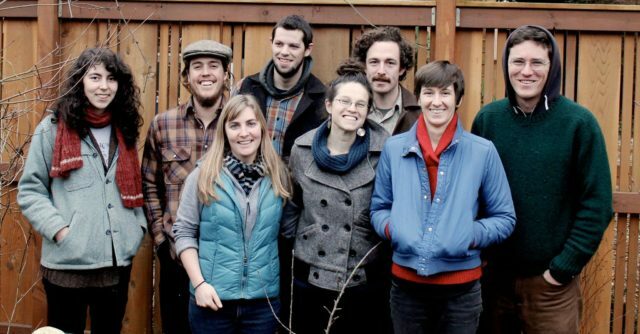 I co-founded NYFC in 2010 to represent, mobilize, and engage young farmers to ensure their success. We are shaping a country where young people who are willing to work hard, get trained, and be entrepreneurial can support themselves and their families in farming. Along with strong local networks and farm services, we believe that access to land, capital, and relief from student loan debt are critical to this goal. The foundation of a successful farm is affordable land. Farmers must be able to pay the mortgage and make a living from the products they grow on the land. When speculation or non-farm uses drive up the price of land beyond this point, farmers and communities suffer. Prime farmland close to markets is paved over or put out of production, and opportunity is sucked dry from rural places where land is the most valuable resource. This trend is not new. But now, more than ever, we cannot afford to let it continue. With more than two-thirds of America’s farmland set to change hands in the next two decades, we risk losing the land that our next generation of farmers need. To address this threat, NYFC is partnering with land trusts nationally to conserve land using “working farm” easements that ensure family farmers will always own and farm protected land. Under these new easements, farm families can pass down their land to future generations of growers and have the peace of mind that their lifetime of work will endure. Federal funding and leadership is vital to these easements, directly impacting how land is used in our rural communities. Keeping farmland available to farmers is only one piece of the puzzle, however. In order to afford this land and begin a career in farming, young entrepreneurs need to build equity in their farm business. Coming from non-farm families, many new farmers must begin by leasing land. They need access to cash to make lease payments, as well as to purchase tools, tractors, animals, feed, and infrastructure. When we surveyed 1,000 young and beginning farmers and ranchers in 2011, 78 percent identified access to capital as a critical challenge to getting started. Since then, we have worked with the USDA’s Farm Service Agency to introduce a new microloan program and change lending rules to improve loan programs for vegetable and livestock producers. These changes have made a significant difference for thousands of farmers, but more needs to be done. Individual Development Accounts and student loan repayment present important opportunities. Individual Development Accounts (IDAs), or matched savings accounts, were authorized in the 2008 Farm Bill, but have yet to receive federal funding. IDAs help young farmers raise the capital they need to buy a tractor or other major farm purchases while they are in training. 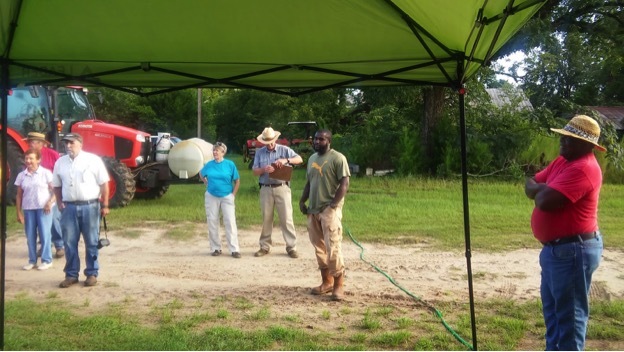 These programs have successfully jumpstarted farm businesses in a handful of states, but public investment is required to benefit farmers in all regions. While access to land and capital are critical to starting a farm business, helping farmers manage student loan debt is likely the most powerful incentive to keep young people farming. As the Higher Education Act is reauthorized, NYFC is looking to incorporate farmers into the definition of the Public Service Loan Forgiveness Program. That means that if you keep farming for ten years or more, you will get some help paying down any remaining student debt. Bringing Americans back into agriculture is no small feat, and will require champions in many sectors. I am excited to work with President Obama and the USDA to ensure that young people have the land, capital, and relief from student debt that they need to succeed in farm careers. Lindsey Lusher Shute is the Co-Founder and Executive Director of the National Young Farmers Coalition. Lindsey and her husband also own and manage Hearty Roots Community Farm, a diversified vegetable farm in Clermont, NY.